Ahead of Apple rolling out the next version of iOS – iOS 8, the company has released its first update to iOS 8 – iOS 8.0.1 which to fix various bugs in its iOS operating system. However, Apple’s latest update keeping some iPhone owners from being unable to make calls, send texts, , toggling airplane mode, or use Touch ID fingerprint sensor. 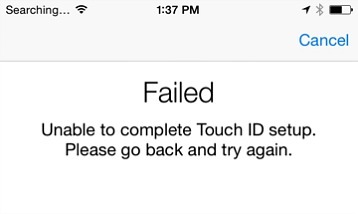 Touch ID feature has been disabled system-wide, and attempts to remove or re-add fingers result in a “failed” message. Apple has taken an immediately action by pulled back the iOS 8.0.1 update from its Developer Center after users complained of bugs and fault and users are no longer able to download iOS 8.0.1 as an over-the-air update. If you have already updated your iPhone to latest iOS 8.0.1, here’s a step-by-step guide on how to recover back to iOS 8. 1. Download the firmware (IPSW file) for final build of iOS 8. You can get it from several website. To begin downloading the IPSW file, head over to this site and select your device from the drop-down menu. Note: the download may take a few minutes depending on Internet connection. To download the iOS 8 IPSW file directly, click on the model of your device below and it will automatically begin downloading the file to your computer. Once the file has been downloaded, connect iPhone to your computer and then launch iTunes. Select under the backup options “this computer,” then hit “Back Up Now.” This takes a full snapshot of your contacts, email, apps and settings, and stores it on your computer. On iTunes in Windows, hold down the Shift key and click the Restore option. Next, select iPhone’s IPSW file and follow the prompts. For OS X, hold down Alt key and click the Restore option in iTunes. And then, select iPhone’s IPSW file and follow the prompts. 2. While the file load, go to iPhone settings > iCloud > Find My iPhone and turn the service off. 3. Connect iPhone to your computer and then launch iTunes. Click on the “iPhone” tab from the source menu on the top right to back up your iPhone. 4. Click the “Check for Update” button while holding Option (Mac) or Shift key (Windows). 5. It will pop up with a file menu where you pick the firmware (which will be an .ipsw file), then hit OK. iPhone will now restore back to old firmware iOS 8.0. 6. To restore all the backup from iTunes, click “Restore backup,” and select the latest backup. Update: In a new support document, Apple says iOS 8.0.2 – which fixes the issues that killed cellular service and Touch ID in 8.0.1 – is coming soon.